There are some days I like to kick back and listen to a certain song over and over and over again. This is one of those songs. 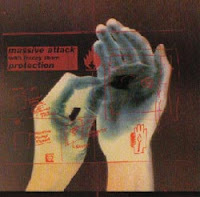 Massive Attack used the vocal talents of Everything But The Girl's Tracey Thorn for their second album, and the title track of Protection became something of a sensation. The music video was something of a wonder, also, as Michel Gondry took on the role of turning the song into a video masterpiece of its own. That being said, you would think that it would be tough to outdo the original. In most cases, I would agree with every one of you. One of the two remixes I've been digging non-stop for fifteen years, now. I had to place an order for the Massive Attack VS Mad Professor CD, and seeing as how Arkansas wasn't really noted for their diversity in music, I was considered something of an oddity for having this disc. A guy I met while at college in Arkansas actually placed the order for me, and he was one of the few that really fed into my passion for music while I was in school there. The Mad Professor mix of "Protection" is nothing short of breathtaking in every way, shape, and form. This has been played to death, and is one of the rare songs I can listen to and just never tire of. The other remix is by ambient and electronic legend Brian Eno. I discovered this remix only recently, but there is a real harkening to his Music for Airports days in this remix. It's astounding in its own right, and I strongly suggest taking a listen. Regardless of what version you prefer, you won't get an argument from me about which one is tops, as I consider all three to be mind-blowing. Enjoy these!